Pinhole leaks in water pipes are a leading cause of water damage in condo buildings. In high-rise buildings pinhole leaks will happen. Unless proactive measures are taken, the frequency of pinhole leaks will increase as a building ages. Copper is used in virtually all residential water pipes. It is durable, light and cost effective. These pipes are also at risk of pinhole leaks as early as five years from installation. Older buildings that do not have copper water pipes are at even greater risk of having more water problems. Water travels through copper pipes in houses and buildings. Over time these pipes will deteriorate. High-rise buildings are more susceptible to pinhole leaks than single storey buildings because of the pressure needed for water to reach all floors of a building. Rushing water can and does erode the inner walls of copper pipes. This deterioration starts on the inside of a pipe and works its way to the outside making advance detection of problems nearly impossible. Eventually a portion of pipe becomes so thin that a small stream of water is released. This is a pinhole leak. Once noticed, it is possible that many more pinhole leaks exist and have gone unnoticed. It is also an indicator that more pinhole leaks may soon arise. Once a water leak starts it travels downward and can damage many condo suites along its path. Over 60% of water damage claims could have been mitigated or prevented according to a Zurich Insurance Claim Study. Active prevention of the source of water leaks can save money for condo corporations and individual residents. Greater internal damage to a building due to water problems combined with an increasing number of insurance claims, higher premiums and deductibles can be costly both to a condo corporation and its residents. 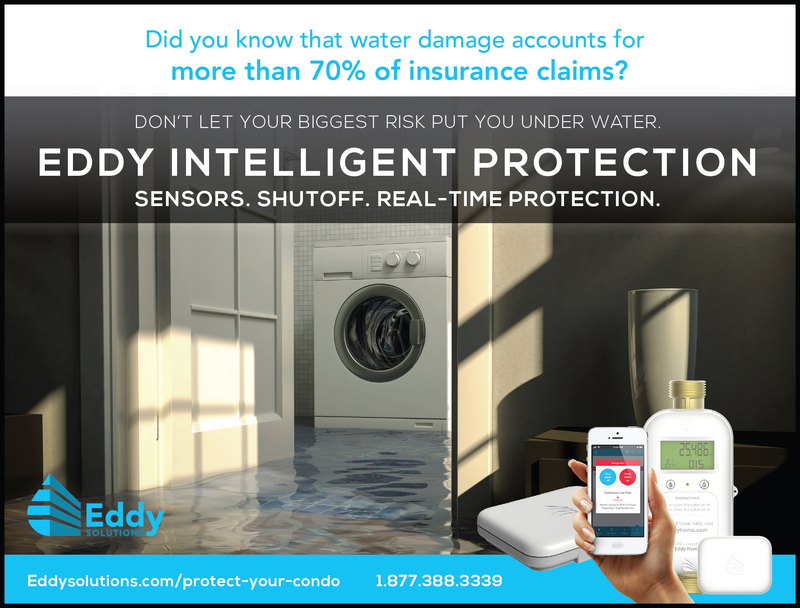 For a condo corporation, an excessive number of water damage claims can result in higher insurance premiums and deductibles. They can also result in an inability to obtain insurance. Condo residents having more than a couple of water damage claims, regardless of the reason, may become uninsurable for future water damage claims. The traditional solution is to replace small sections of water pipe as pinhole leaks are identified. This approach will not help to identify where the next pinhole leaks are likely to occur. Proactively replacing pipes is expensive – between $5,000 and $15,000 per suite to replace pipes in a high-rise condo building. This includes the cost of breaking holes in walls and ceilings to access pipes. A more proactive approach is to apply an epoxy coating to the inside of the water pipes throughout a building. This coating will adhere to the inside of the piping. It can seal existing pinhole leaks and help prevent future pinhole leaks. Epoxy coating can save up to 30% of the cost of pipe replacement and can be installed much faster. LEaC Shield, a Canadian company, has developed an even more economical solution combining the rapid prevention of pinhole leaks and reduced cost of applying a thin coating on the inside of existing pipes. By using a mineral coating consistent with what is used by Ontario municipal water services, the company provides a faster, lower cost solution to pinhole leaks that does not impact on water quality or the operation of equipment used to heat and transport water through a high-rise building. Installation can be complete in a day thereby providing nearly immediate protection against pinhole leaks. At a cost that can be as low as $120 per suite, this solution may save hundreds of thousands of dollars in direct repair and replacement costs plus more in reduced insurance premiums and deductibles.